This is the definitive history of a fine regiment. It has two main merits. 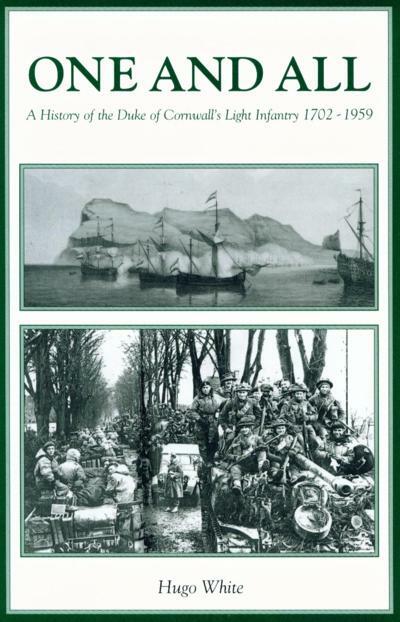 Anyone with a personal or family connection to the Duke of Cornwall’s Light Infantry will find it invaluable as a detailed account the regiment’s life from the raising of its oldest ancestor, Fox’s Marines (soon to be the 32nd Regiment of Foot), in 1702, to its amalgamation with the Somerset Light Infantry in 1959. But, in a wider sense, anyone seeking to understand the practical workings of that puzzling, infuriating, endearing and invaluable thing, the British regimental system, will find its mechanism laid bare here. Fox’s Marines were raised to fight in the War of Spanish Succession, and received their baptism of fire in an attack on Cadiz, where the effectiveness of the allied force was as much hampered by the abundance of sherry (Jerez is close by) as by Spanish resistance. The regiment defended Gibraltar during the first siege (1704-5) during which Edward Fox was killed, and his regiment was taken over by the brave but quarrelsome Jacob Borr. After the war the regiment never quite ceased to exist, although it was much reduced, and it fought at Dettingen (1743) and Fontenoy (1745) during the War of Austrian succession. Thereafter the 32nd, for so we may call it, for regiments were now referred to by their seniority in the line, rather than by the names of their colonels, served in Scotland, Ireland and the West Indies, gaining its connection with Cornwall in 1782, although this link fell far short of the closer ties which came the creation of county regiments a century later. In 1877 the 32nd was linked with the 46th (South Devon) Regiment of Foot, the first part of a process justified, in terms familiar to many readers, by the need to produce the flexibility deemed lacking in single-battalion regiments, and in 1881 the restructuring was completed when the regiments amalgamated to form the DCLI. The 46th begun life as Price’s Regiment in 1741, but made a poor start, running away, with most of the royal army, when charged by the Jacobites at Prestonpans in 1745. It then served in North America during the Revolutionary war, was in the West Indies for most of the Napoleonic wars, and went to the Crimea in 1854. The advance party of 46th fought at the Alma and at Inkerman, and the main body arrived in time to do duty before Sevastopol that terrible winter. It is a fitting comment that of the 706 men of the regiment, nineteen were killed in action, four died of wounds and another 481 died of disease. The 1881 amalgamation produced tensions, but the regiment soon settled into the pattern of soldiering in high Victorian times, with one regular battalion generally abroad and the other generally at home: the 1st Battalion served in India, Ceylon and Burma, and the 2nd Battalion fought in the Sudan campaign of 1884-5 and in the Boer War of 1899-1902. When the militia and volunteers were combined into the Territorial Force in 1908 the regiment had its two regular battalions, a 3rd (Special Reserve) Battalion, and two Territorial battalions. The First World War involved all elements of the regiment which existed in 1914 and more too, as Territorial battalions were divided, service battalions were raised from wartime volunteers and, from early 1916, conscripts were added. The regiment raised sixteen battalions in all, including ‘split’ Territorial battalions, and also formed two volunteer battalions for home defence. Battalions of the DCLI served on the Western Front, in Italy, Salonica, Egypt and Palestine. At the war’s end the DCLI reverted to its pre-war mode, though now with only a single territorial battalion instead of two. The 1st Battalion found itself at Lucknow, ‘the most revered battle honour in DCLI history’ in 1923-7, and in 1920 the 2nd Battalion was in Iraq, losing two men killed and five wounded near Nasiriyeh. During the Second World War the familiar pattern repeated itself, with battalions serving in most of the war’s main theatres. The 1st Battalion was effectively destroyed in the Cauldron battle in the Western Desert in June 1942, and eventually reconstituted in the UK, being presented with colours previously laid up in Bodmin church. The 2nd Battalion fought in France in 1940, before moving to North Africa and Italy, whence it departed in 1944 to participate in the Greek civil war. The 5th Battalion landed in Normandy as part of 43rd (Wessex) Division, and took part in the ferocious battle for Hill 112. The division lost nine commanding officers in a fortnight: 5 DCLI had two of its COs killed. The war was followed by an unquiet peace, with the 1st Battalion serving in Palestine, Cyprus and British Somaliland. The 1st and 2nd Battalions were amalgamated in 1950, and the new battalion served in Germany and the West Indies, celebrating the 100th Anniversary of the relief of Lucknow just before it was amalgamated with 1st Battalion The Somerset Light Infantry to form 1st Battalion the Somerset and Cornwall Light Infantry in October 1959. That Regiment lasted only a decade, until The Light Infantry came into being, and, as I write, that too is about to be merge with the Royal Green Jackets, forming a new regiment to be styled The Rifles. Yet my head raises an uncharitable objection. The DCLI, with its close links to that county whose name it bore, existed for less than eighty years. Valuable though those links were, they had been no help to the 32nd, with its many fighting Irish, in its epic stand at Lucknow. County regiments, stamped indelibly on our military history, are demonstrably not the only form of infantry organisation that has served us well. The DCLI’s last brigade commander recognised that what he really valued was the regiment’s qualities: ‘no job is too difficult, no duty too dull or irksome. In man-management, in bearing and turnout, in discipline and sheer efficiency, the best and only the best is acceptable.’ The real merit of the British infantry across the centuries has been to preserve qualities when organisations change, for change they must in a world where few things are constant. But none of this stopped me having to blink rather hard when I saw the photograph of Colonel Williams leading his troops out of the depot at Bodmin for the last time. or paperback £16.95, ISBN 1873951 plus £3.50 p.& p. = £20.45. Post & packing on overseas orders depends on the country to which the order is going. Payment is preferred by cheque made out to Tabb House, but for overseas orders we do accept Visa, Delta, Mastercard and Switch cards (via an agency). Please mention this website to Tabb House in your post.